Lubricant Marketers, do you have a way to easily and automatically get fuel price notifications to your customers or prospects? Fuel Price Notifications are a nice and simple way to get fuel prices in front of your customers and prospects and stay ahead of your competitors. Since fuel prices can change every day, Lubricant Marketers use Fuel Price Notifications in CRM to blast out fuel prices to mass audiences. This saves Lubricant Marketers a lot of time while helping them personalize fuel prices by territory according to territorial taxing and pricing based on economic shifts. As a Lubricant Marketer, if you’re used to manual methods of reaching out to your customers one-by-one or even making calls to them one-by-one, which can last a few days of your work week, Fuel Price Notifications help you put everything together simply in less than a work day’s time (… much less). With Fuel Price Notifications in CRM, you can include your company name, a fuel price quote, the date, and specific product markups. 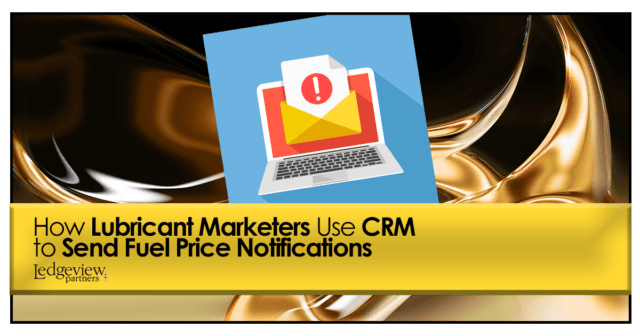 Fuel Price Notifications will take care of filling in the rest of an email blast automatically in CRM for Lubricant Marketers. The only thing Lubricant Marketers usually need to fill in themselves in CRM are any disclosures, and whether or not you want to include a sales rep’s name and contact information. Fuel Price Notifications are a huge benefit for Lubricant Marketers. By automating your fuel price notification process, you save more time on other tasks that require in-person attention as a Lubricant Marketer. This is another great example of how CRM uniquely helps those in the Oil and Gas industry. Discover other ways Lubricant Marketers are using CRM to meet industry demands, create new business, and stay ahead of the competition when you read, “11 Ways Lubricant Marketers Use CRM to Drive Success”, a new eBook by Ledgeview Partners.